Mexican Rajas con Crema are flame roasted poblano chiles, cut into strips and cooked with onions and garlic and Mexican crema. Depending on the heat of the poblano pepper, the dish can be spicy or slightly spicy. 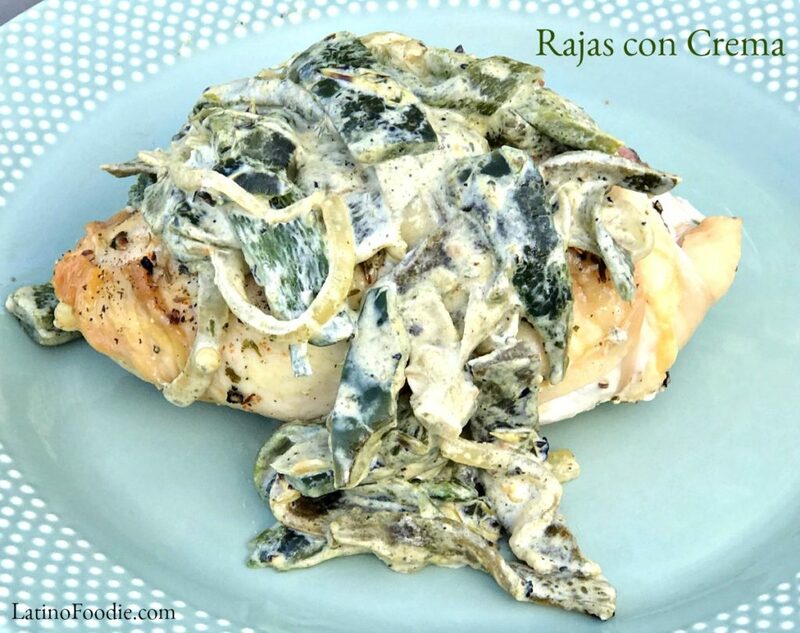 People eat Rajas con Crema simply in a corn tortilla as a taco or top a chicken breast or steak with the creamy mixture. Others will add a light cheese like Oaxacan or Monterey Jack Cheese, but that can also turn this dish into more of a Queso Fundido. Others will add potatoes or chicken or corn, as I have added in the photo above. I’ll make enough to have some without the traditional way and then I do enjoy adding chicken and corn kernels to turn the Rajas con Crema into an entree. We hope you enjoy this simple yet delicious recipe. Let the skin char slightly making sure you turn them to have an even roast of the skin.